When I moved to Boston, I immediately contacted the Papercut Zine Library. I’ve started volunteering there, and on Friday I got to go to 826 Boston to help teach a zine-making workshop. Clara and I went to 826, and we spent two hours teaching four kids ages 8-11 how to make zines. It was a very positive experience – the kids were absolutely awesome, the staff was as supportive as needed, and each kid ended up with a pretty imaginative, awesome zine. The two boys in the group were both into WWE wrestling (which I happen to have a knowledge-base of) so we bonded while they decided what kind of wrestling zine to make. This zine features the author’s top five favorite wrestlers, and his top five least favorites. I have to say, I agree with him on Edge (but I don’t like him because his eyes stick out funny, and is therefore not cute). His favorite is John Cena, who hails from MA. In all, it was the best zine-making experience I’ve ever had. Between Clara and I, we were able to give a lot of personal attention to each kid, and I’m so impressed that they were able to make clever, imaginative zines in two hours. My new job is awesome in about 41 ways. It’s for a website I <3, it’s helping the library world become better, and I get to work from home. I’ve always be just a little hesitant to get tattoos that are easily seen, and thus far have been able to avoid showing them whenever I want. To be fair, I don’t think it would have been a problem at the public library I worked at – the director is pretty cool, and the patrons certainly enjoyed my pink hair, and I’ve seen more than one back tat on a mom. 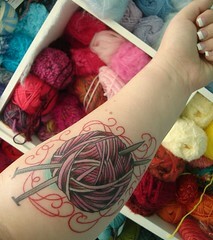 But, now that my job involves even less formal attire, I REALLY WANT A TATTOO LIKE THIS. I just think it’s the most gorgeous thing I’ve ever seen. I posted about this before, but it really requires a full post of its own, especially since I can’t stop talking about it, and today I gave my website addy to the cashier at Old Navy while gushing about how their Sweetheart jeans fit me just perfect, and I know this because of Zafu. You know how it’s hard to find bras and jeans that fit? And it seems they’re tailored for someone with a body shape very different than your own? Zafu asks you a bunch of questions about your body and how the item usually fits you, then gives you a list of specific items that should fit you better. I needed new jeans, so I tried it out. Lo and behold, I’m sitting at home in my cute new jeans, which don’t gap at the back, or make my thighs look gross. It’s amazing! I used to think that it was lame for women to know all about what their husbands were into. I thought is smacked of male-dominated relationships. You’re not actually into model trains/ham radios/historical recreations/bonsai, so why are you talking about it, and using the pronoun ‘we’ even though we’re the only two people in the room? Anyway, I’ve recently realized that being involved in your partner’s interests means more to share and enjoy together. I knew this, of course, but today I was able to use what I’ve learned from Jason’s L33T skills and start-up knowhow when applying for a sweet sweet job (that I won’t be talking about until I know if I’m actually in the running). Then I read an email from a favorite aunt, and allofasudden it hit me that the interest and knowledge she’s gained from being married to a conifer expert has made her an expert too, and it’s a cool, neat thing. Now that I think about it, I know that there’s no way she’d get this into conifers if she didn’t already have an interest. Having a partner super-into it just makes it more likely that you’ll learn more. So I think there should be some sort of nomenclature for this, a rating of how much you know about architecture, or dancing, or cattle, or programming because you spend your free time with someone who’s interested in it too. Partner points? Personal interest rating? I’d say I have a healthy knowledge of Internet start-ups just by being with my partner, and I want to be able to convey that in a cover letter without sounding too wifey. And now maybe I can find a way to get Jason knitting. The Improv Everywhere group did an impromptu performance at Grand Central Station in NYC. 207 people froze at the same time, for five minutes, then continued on with what they were doing. The video is so much fun to watch. I’m a big fan of impromptu group activities (Critical Mass, por exemplo) and the best part is seeing the reaction of the passers-by. Watch it! Watch it! Watch it! Today I slept in (8:40! ), reached my hand over to the nightstand, pulled over the Nintendo DS, and played videogames for an hour. Then a bubble bath, and a call to my sister. Now I’m eating frosted mini wheats and updating my Goodreads. I’m going to go pants shopping (thanks ever so much to Inky for pointing out this fabulous website that asks you in-depth questions about jeans and bras and such, then offers suggestions based on your body shape) and meet Jason for a birthday dinner. I was thinking about picking up a tiara to wear, but it’s snowing and I don’t think it’ll fit under my hat. Maybe I need to knit a hat that has room for a tiara, or a hat that has a tiara on it. That would be totally Fancy Nancy. I read a lot of kid lit blogs, which often dictate what I buy for my library’s collection. It occurred to me just now that I would very much like to review children’s books, and specifically I think I have a knack for determining what kind of read they are. With pre-readers and early readers, there are a lot of options. Along with reviewing the book as a whole, it would be nice to describe what kind of read it is. So how do I start reviewing for a blog? I’d better email some of my favorite kid-book-bloggers to ask.